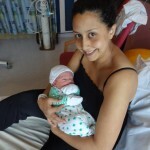 I have a fantastic birth story for you from the lovely (and hugely inspirational award winning entrepreneur!) Sara who runs Crafter’s Companion. 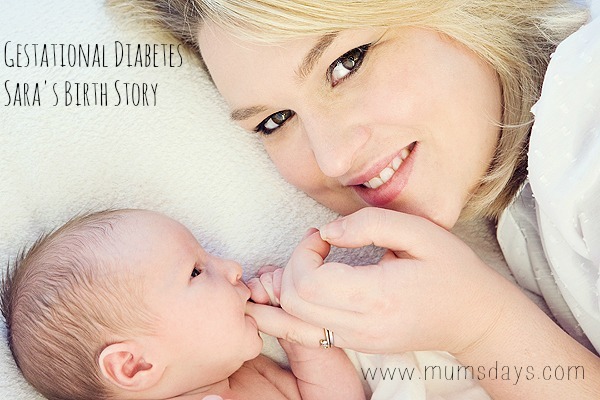 It covers everything from Gestational Diabetes to induction to Diamorphine to beautiful baby! And, because Sara actually did her research, she knows what everything is called (unlike me and I had the exact same drip thing for my induction!). I hope you enjoy this story from this first time mum! I’ve always been a big organiser, planner, and yes, you guessed it, I like to be in control! After starting my crafting business, Crafter’s Companion, from my University bedroom I kind of had to be. Having been with my husband, Simon, for over 15 years I knew that when I hit my mid-twenties I wanted to start trying for a family. However, as Crafter’s Companion was really taking off I decided to delay for a few years. As it turns out, there’s never an ideal time to have a baby so eventually, after deciding that I was emotionally mature enough to become a mother, I bit the bullet and went for it! When I fell pregnant I decided that I was going to restructure the business so that I could take a step back, focus on my baby-to-be and allow others to come forth and shine. My mother had also owned her own business, which had allowed her the flexibility to do the school run every day and spend quality time with her children. It was my mother that inspired me to become my own boss so that I would be able to do the same for my children, and I didn’t want to lose sight of this as my business grew. At 20 weeks I was showing as large and a scan dealt me the unexpected blow of confirming that I had Gestational Diabetes. Not only was I shocked but my community midwife was in complete disbelief as I didn’t fit any of the criteria. Following the scan I was monitored over the next two weeks but despite trying to control the diabetes through my diet, the severity was such that I had to begin taking insulin to steady my levels. To begin with I had to inject myself once or twice a day but I ended up having to inject myself after every meal, so pretty much every four hours – not fun! The injections, coupled with the fact that I couldn’t enjoy chocolate or cream cakes anymore, put a real dampener on my pregnancy for a while, but the silver lining was that I actually ended up losing weight! Before I fell pregnant I was a perhaps verging on being overweight and if I hadn’t been diagnosed with Gestational Diabetes then I would have over-indulged, I know me! As I had no choice but to eat incredibly healthily I ended up being able to control my weight which has meant I’m not struggling having to lose baby weight now. Owing to the severity of my diabetes I had to go to the hospital and have a Bio Physical Profile taken every two weeks, which showed that my baby was in the upper 97th percentile in terms of his weight. As a result, they wouldn’t allow me to go past 38 weeks without being induced. I’m the type of person that can cope with anything, so long as I feel I have control of a situation. In order for me to deal with my condition, knowledge was power. Over my pregnancy I had built up a great relationship with my community midwife who had really taken the time to get to know me as a person. As such, after every Bio Physical Profile was taken, I would go to her clinic on the same day and she would go through my notes in layman’s terms, which really settled my mind as to what was going on inside me. I attended ante natal yoga for months as a way of forming new friendships with those who were in the same situation as me; none of my friends had yet had babies so I was the trailblazer! In addition, I joined the NCT course, again to make friends but also to thoroughly understand the process of induction, which allowed me to feel more in control of my impending birth. At this point I have to say that the NCT course was exceptional. It was a small group comprising three couples and as such the learning was tailored to each of our pregnancies – I’m still friends with the people we met through the course, and several of my yoga going mums, which is lovely. In terms of birth plans, I had three! One for a natural birth, one for an induction and one for an emergency c-section. One thing I was adamant about was that I didn’t want an assisted delivery if possible. I wanted to take on the pain in order to avoid an epidural. However, my midwife advised to take this stipulation out as I couldn’t fully appreciate the pain of being induced at that point. So, the day for my induction arrived: Thursday 5th December. The first pessary I had didn’t work so I was given another just before bed. The idea was that it would work its magic overnight so that they could break my waters in the morning. The morning came and I was measuring 3cm dilated and was advised that as soon as a bed became available in the labour ward I would be transferred. Unfortunately I had to wait until 3pm, only for my next examination to show that I was actually 1cm dilated. 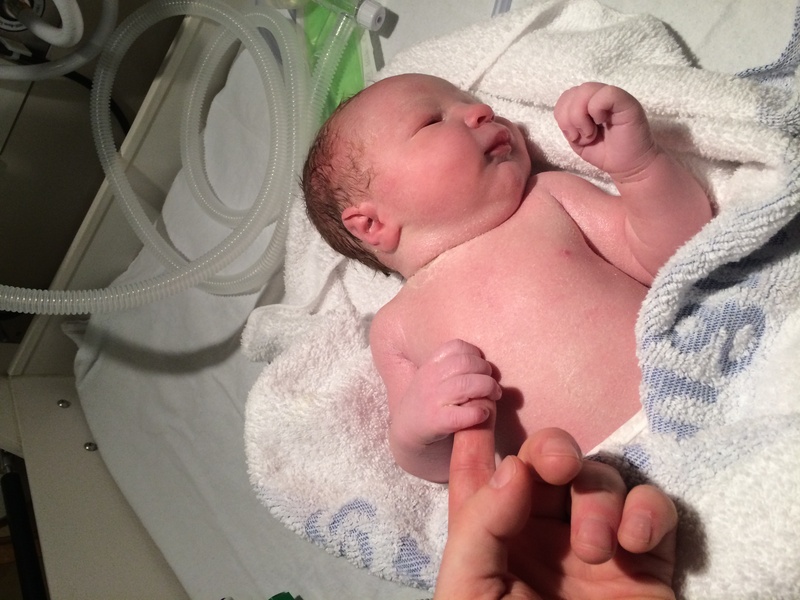 The disappointment was immense and my midwife said that she could see my heart sink. The registrar then only had me at ½ cm but they managed to get in and break my waters anyway. This was at 4pm on the Friday. I was then put on a drip to administer syntocinon, a synthetic version of the naturally-occurring hormone oxytocin, which stimulates the uterus to start contracting. The difference, I learnt, between being induced and going into natural labour, is that when the body releases oxytocin it simultaneously releases a natural pain relieving hormone and everything builds gradually. 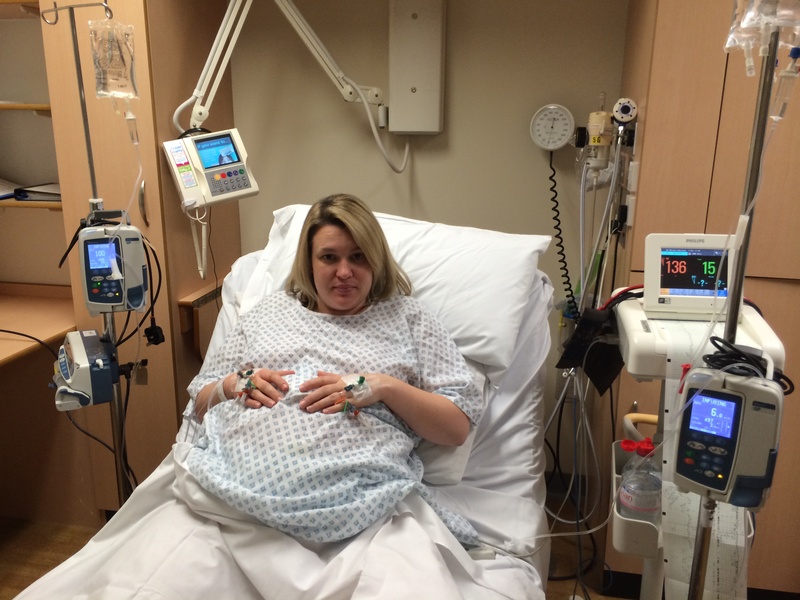 With syntocinon, no natural pain relief is released and you go from nothing to full blown labour very quickly -in my case it was 1 hour and five minutes. It was now 6pm. At this point I was advised that I would be here for 10-12 hours so to mentally prepare myself. The issue I had was that all the preparation and courses I had undertaken were aimed at allowing you to control your pregnancy. The fact that I was having to just lay on a bed, being hooked up to the machines whilst my contractions happened was incredibly frustrating. I once tried changing positions to help relieve the contractions and it took around 25 minutes! At this point the midwife suggested an epidural, I agreed and she went to get the anaesthetist. Whilst she was gone I asked Simon if he thought I was giving in too easily or if this really was my breaking point – I trust his opinion implicitly as he knows me better than anyone. Simon thought I might regret it if I had the epidural then and encouraged me to see how much longer I could go. So, I changed my mind. A new midwife came on duty at 8pm and she was amazing! For the next six hours she held my monitor to allow me to stand up (albeit hunched over Simon!) and at 10pm she told me in an incredibly positive way that I was 4cm dilated – it was her enthusiasm and positivity that motivated me to carry on. By 5am I was told to push with every contraction and was being helped by gas and air. However, I suddenly thought back to a programme that I had seen, which showed you were only allowed to push for two hours. So, still fuelled by remnants of diamorhoine and gas and air I thought I’d just push as much as I could and pretend to be having contractions when I wasn’t! It never occurred to me that everyone could see exactly when I was contracting on the monitors surrounding me – I wasn’t fooling anyone! 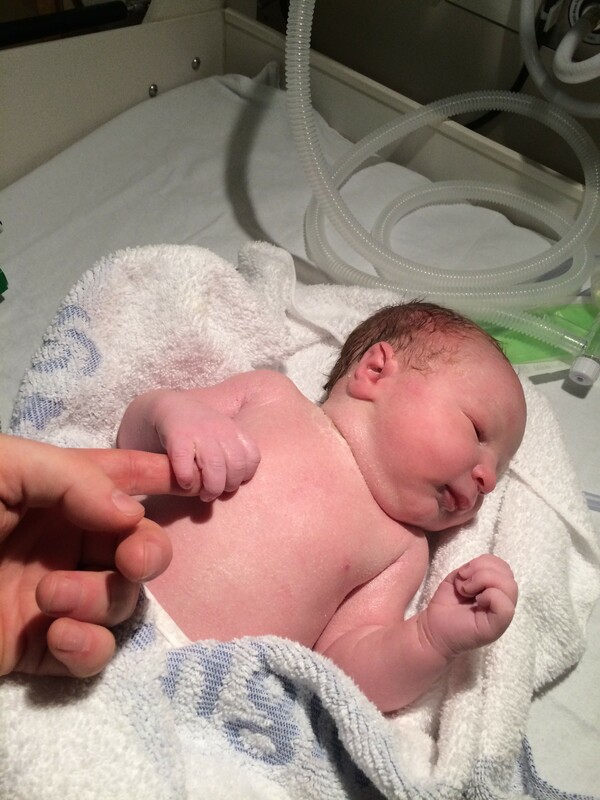 Then, before I knew it, my beautiful baby boy arrived at 6:15am – Oliver Jack Davies weighing 8lb 10oz. Head came first and I remember thinking, oh they can just pull the rest! He was given to me for skin on skin and I was totally in awe, it’s true what they say, within 15 minutes I had forgotten the pain and I all I felt was elation. As soon as I could I passed Oliver over to Simon, I couldn’t wait to see him hold and stare at his son, all tiny and wrapped up in blankets – it was a vision I’d fixated on my whole pregnancy and it didn’t disappoint. I had been so worried through my pregnancy that something was going to go wrong – I’d been so blessed with my family, friends and business that I felt I couldn’t possibly have a happy, healthy baby, but I did! All I could think was how grateful I was, and I will always continue to be! Thank you so much for your story Sara! Body Confidence: How I learnt to love (and accept) my body.